The bags were distributed to two retail stores in Colorado, one retail store in Washington, and one retail customer in Maryland, and a complaint was received by a customer who had contact with the product. According to the company, Chicken Sprinkles are typically sprinkled over a dog’s regular food to enchance flavor. 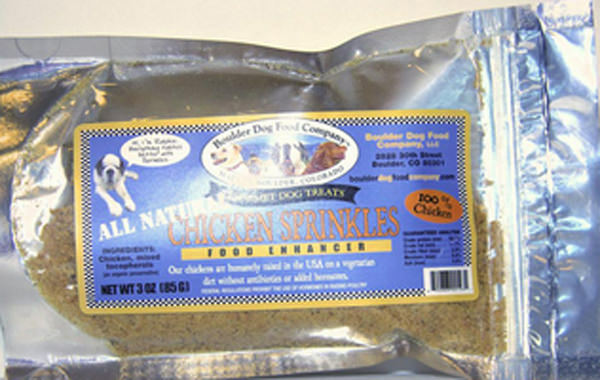 They’re sourced from cage-free chickens raised on a vegetarian diet without the use of additives. The good news is that eight of these bags have already been recovered by the company. Only two remain, and the company believes they have already been “used or destroyed,” though it does not provide specifics. Consumers with questions may contact Boulder Dog Food Company at 303-449-2540 or visit the company’s website.